I’ve covered several of Chilean writer Alejandro Zambra’s books (including My Documents and The Private Lives of Trees), but Not to Read (translated and edited by Megan McDowell, review copy courtesy of the publisher) marks the first time his non-fiction work has been translated into English. The collection consists of a variety of essays, ranging in length from five-hundred words or so to longer pieces stretching to more than fifteen pages, but while there is also variety in the subject matter, the common thread running through the selections is reading, and the writer’s views on authors and books. That’s how they taught us to read: by beating it into us. I feel sure that those teachers didn’t want to inspire enthusiasm for books, but rather to deter us from them, to put us off books forever. They didn’t waste their spit extolling the joys of reading, perhaps because they had lost that joy or had never really felt it. Supposedly they were good teachers, but back then being good meant little more than knowing the textbook. There are several other personal touches in this section, with glimpses of the writer’s personal reading history in the form of a photocopied personal library and musings on marginalia he discovers in old books (and promptly disagrees with). Many of these short essays then see Zambra move away from his own history and explore the wider world of literature. The writer does talk about books he likes, but he’s just as likely to focus on those he doesn’t, and in the collection’s title piece, he goes Bartelby on certain books and authors he’d prefer not to be exposed to. Later, we find several prominent names, in particular Pablo Neruda and Mario Vargas Llosa, summarily dismissed on several occasions, meaning Zambra is certainly not a man afraid of speaking his mind. Now that I think about it, it’s not hard to imagine one of her characters watering or carefully pruning plants. I feel like I’ve read a story by Alejandra – a non-existent story that I still feel like I have read – about a character who gets up at four in the morning and instead of drinking a glass of water or smoking a cigarette, goes out to the yard, starts to water the garden, and as the water falls and soaks her slippers, starts to feel something like happiness. I’ve never read that story of Alejandra’s because Alejandra hasn’t written it, but I think she should. I think it would be a beautiful story, one that only she could write. He goes on to mention (among others) Manuel Puig, Hebe Uhart, Josefina Vicens, Daniel Alarcón and Dino Buzzati, taking us on a literary tour of Latin-America and beyond. In many ways, Not to Read is reminiscent of a couple of other books I’ve tried by Spanish-speaking writers, Andrés Neuman’s How to Travel without Seeing and Sergio Pitol’s The Art of Flight. What these two have in common with Zambra’s book is the way they tempt the reader to go out and track down the work of the writers mentioned in the book. 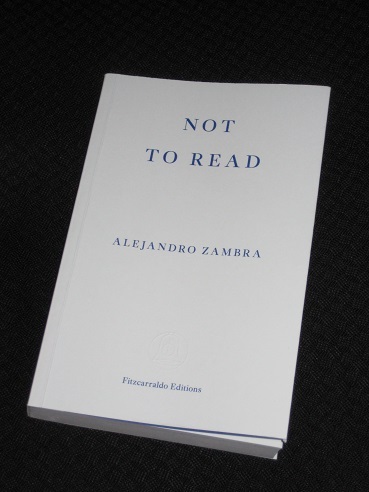 The final section of Not to Read sees a return to more personal themes, with the inclusion of a number of lectures focusing on Zambra’s own experiences. ‘Notebook, File, Book’ is a lengthy discussion of the effect of the digital age on writing while ‘The Boy Who Went Mad from Love’ has Zambra opening up a little more on his reading life. Then there’s ‘Free Topic’, in which he happily discusses some of his own writing, including pieces that didn’t turn out exactly how he wanted. I like to think that when we publish books, they are like children leaving home: we wish them well, but there is little or nothing we can do for them. And we are much more interested in the book we’re writing now, the one we are raising now. That afternoon, sitting on the curb, I thought that from then on my novel would live very far away,and that maybe it was on its way to becoming one of those ungrateful children who never call home. Happily, he comes to realise that while he may have lost his ‘child’, a whole new audience has been granted access to the story he developed. Most of Zambra’s work has been translated by McDowell, all of it excellent, and she’s done another great job here, with a role that includes editing (I suspect this means choosing and arranging the pieces and *not* editing her own work…). In addition, she also provides an excellent short foreword which sets the scene, and explains where the texts were originally published. The original Spanish-language version has actually undergone several changes over the years, and I suspect that it’s a work that will continue to grow as Zambra speaks more about his reading and writing.